Who needs a superhero when you have your dad? Written in beautiful rhyme this is an excellent story that honors all fathers in the world. Who Is Your Biggest Fan And Hero Of Your World? You know the answer would be your Dad! The story explores girls's bond with her dad and his incredible super powers. The little girl always has awesome piggy back rides with daddy. Dad can gobble up any monsters and say they taste like cookies. Dad survives his girl finger painting and makeover sessions. He's always there for all situations from scraped knees to broken hearts. This picture book has a great bedtime story and fantastic illustrations that will make you happier or just put a smile on your face. 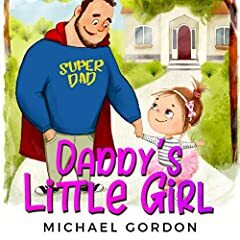 You and your kids will love this daddy book...grab it now while it's still available at this discounted price.